I started with a Meade 390 90mm Refractor. Humble beginnings but I had to start somewhere. My wife Michelle went back to university to complete her degree in Accounting so I took an opportunity to look around the internet for astronomy websites and ended up downloaded a demo of Skymap which propelled me into the hobby of astronomy. Not knowing a lot about the night sky at all, I put my limited knowledge to good use and got outside and discovered things like Jupiter and Rupes Recta on the Moon and I was away laughing. After about 6 months, I was looking for a higher power eyepiece for the planets and I noticed a telescope for sale in the Trade & Exchange amd ended up buying the telescope as well as the eyepiece. I had two telescopes. The new telescope was a Meade 4.5 Inch Reflector and served me really well during the Opposition of Mars in 1999. After the 4.5 Inch Reflector was bought the 90mm Refractor was left to gather dust. I eventually sold it and kept the 4.5 Inch. I bought a 32mm TeleVue Plossl and stashed the rest of the money away for the next step...a Celestron 8" Dobsonian. 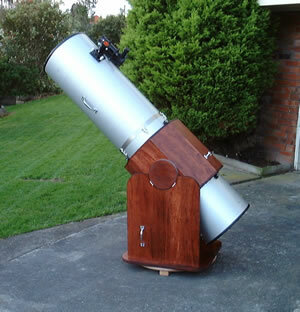 My 8 inch Celestron Dob arrived in early June 1999. This was a substantial scope. Cardboard tube and telescope barely was transportable but we managed with our car at the time. The 8 Inch Dob showed me the sky as I had never experienced before, and armed with a UHC Filter and other new accessories, I had a ball with the Dob. But still, in the early part of 2000, I was not happy with a few things about the Celestron. A single stalk holding the secondary was a pain causing the collimation to be an issue. I improved the movement by putting Ebony Star Formica on the base and blacked the tube with velvet. The real issue was the bending over to observe. This was causing me difficulties as my back was not really up to the bending. This and a pressing need to observe deeper put ideas into my mind that maybe I could construct a 13 inch Dobsonian made from both local and US made components, rather than buying something.. 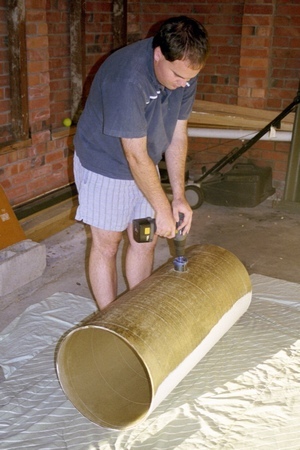 In July 2000 I decided that I would like to build my own telescope. I got 'The Dobsonian Telescope' by Kreige for my birthday in July. From this I formulated a plan to construct a telescope along with Dave Brock's successful tube Dob design. 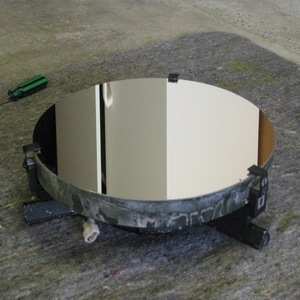 I sold my 8 Inch telescope 9 months too early and ordered a 13.1 inch mirror from a local telescope mirror maker Graeme Jonas in December 2000. Once I had confirmed the mirror size and focal length, I purchased a 2.6 inch Protostar secondary assembly, and a Novak mirror cell. Along with these items a bought a 2 inch focuser from JMI and a Telrad and a 8 x 50 Erect image Finderscope. I arranged the ply, tube, Formica & Teflon and bits and pieces locally. One thing remained to be solved. Even while I was waiting for the telescope tubes to arrive, I had to solve the upcoming transportation issue. We needed a larger car for the telescope. I decided on a Ford Telstar wagon, it was in very good condition and would serve the purpose nicely. I had a good deal of help from friends and family. I decided to build my telescope based on a friend and fellow observer Dave Brock. Dave has made many telescopes, grinding his own mirrors and making all of his own components from scratch. A real inspiration. 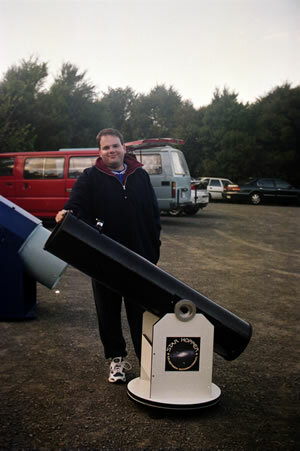 I completed the telescope July 2001 and quickly put the telescope to good use on a clear weekend away from the city. Rotating Tube for easy viewing. Etched Teflon & Formica Stardust Altitude & Azimuth Bearings.